Rosacea-Ltd IV® is an ocular rosacea treatment providing 99% positive results for patients with eye symptoms of persistent redness burning, gritty dry eyes, blepharitis, keratitis and iritis as you will see in the picture. Compare your past ocular rosacea treatment with Rosacea-Ltd IV® to see the improvement. Try Rosacea-Ltd IV® for ocular rosacea with our 100% refund within 120 days. The Ocular Rosacea Treatment of the past has been frightening to some patients. Ocular rosacea is a serious condition that needs to be brought under control quickly. Some patients have experienced blurry vision or some loss of vision with the use of some eye drops containing both antibiotics and steroids. One of the concerns in ocular rosacea is the possibility of a secondary infection, since a dry irritated eye environment is a good breeding ground for bacteria like staphylococci. The process of applying Rosacea-Ltd IV® to the eyelid for Ocular Rosacea is the same as the facial rosacea skin area. First, hydrate by drinking the proper amount of “alkaline water”. Second, wash the facial skin and eye area and leave the skin wet as well as the eye socket area. Third, the design of the “tan” Rosacea-Ltd IV® disk allows for an easy application to the contour of the eye area or any other ‘eye area’ that has symptoms of Ocular Rosacea, redness or blepharitis, keratitis, iritis, hypopyon iritis, or conjunctivitis, styes, or seborrheic dermatitis. The Rosacea-Ltd IV® “tan” disk is gently glided over the closed wet eyelid or eye socket area for a quick application of the ingredients which will dissolve the proper amount to the exterior closed eye lid. This process is only a 1/2 second application or a ‘touch application’ (like the model to the right) is needed to restore the beauty of the ocular rosacea or eye rosacea affected area usually within 7 to 10 days. The natural ingredients are within our body, facial skin and eyes already. These same ingredients are within our Rosacea-Ltd IV® disks are exactly what the ocular rosacea eye needs, and have been helping ocular rosacea patients worldwide since 1997. 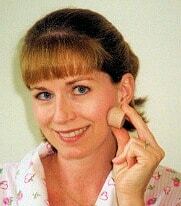 The ingredients in our patented Rosacea-Ltd® disks are as follows: zinc oxide, polyethylene glycol which helps the disk to glide easily over the eyelid, copper oxide, cornstarch (also for smoothness & gliding of the disk), iron oxide, sodium chloride which are all essential natural element of the human body. These ingredients are proven to produce beneficial and healing results. Ancient Eye medication much like Rosacea-Ltd® found in 2,000 year old Roman shipwreck. Here you may review the natural ingredients within your own body. The pH of 7.0 of our Rosacea-Ltd® IV disk ingredients which is excellent as needed for tissue healing and ocular rosacea. Ocular rosacea also known as rosacea eyes or eye rosacea is defined as an inflammation of the eyes often associated with the skin condition acne rosacea. Ocular rosacea can cause a persistent burning or gritty feeling in one of both eyes of the rosacea patient with resulting eye redness. For others, it can manifest itself as inflamed and swollen eyelids with small red bumps, eyelashes that may fall out, compounded by bloodshot eyes. 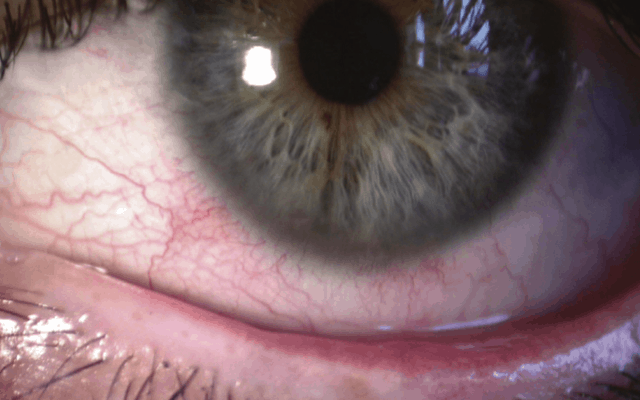 The ophthalmic symptoms can vary widely, including conjunctivitis, blepharitis, iridocyclitis, iritis, hypopyoniritis, and in more severe instances keratitis. The most common symptoms include chronically inflamed margins of the eyelids with possible scaling and crustiness. The appearance is quite similar to seborrheic dermatitis, with which ocular rosacea is often confused. Pain and abnormal sensitivity to light may be present. The ocular complications of rosacea are independent of the severity of facial rosacea. Ophthalmic or ocular rosacea is an all-inclusive term covering all these symptoms. The severity of ocular rosacea to facial rosacea is closely related. Between 50% and 60% of patients with facial rosacea have ocular rosacea. Usually the ocular rosacea patient is more dehydrated than the facial rosacea patient. The average human body is composed of approximately 65% water while the eye is roughly 96% water. Therefore one should drink the amount of water on a daily basis that is appropriate for the body size, exercise, work conditions, climate dryness and exposure to the outside heat and wind. Likewise most all rosacea patients are low on water while being too high on coffee, tea, soft drinks and alcohol of which all push water out of skin cells and all other body organs including the eye. The inflammatory ocular condition that affects the eyelids is Ocular Rosacea Blepharitis which has symptoms of burning, itching, dryness and therefore and irritation and red eye lids. Some patients have styes which are personally bothersome socially as well as physically. Some patients also have keratitis which involves the cornea which is red and irritated. Others have ocular rosacea conjunctivitis. Keratitis is quite bothersome due to an infection of the cornea with pain, blurry vision, and often light sensitivity. Ocular rosacea iritis involves an inflamed iris with an eye pain, sensitivity to light, and/or blurry vision which is often very much like the appearance conjunctivitis or “pink eye”. Also some other disorders are conjunctival Telangiectasias, crusty eyelids, psoriasis, and increased sizes of veins and arteries. Ocular rosacea patients have the appearance of “bloodshot” eyes due to the dryness and inflamed eyelids. An advanced stage of ocular rosacea pterygium is shown to the left. This growth is non-cancerous yet quite debilitating and socially awkward. 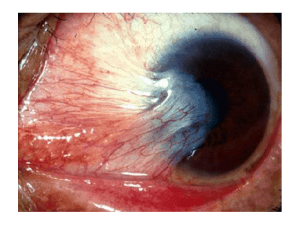 Ocular rosacea pterygium starts in the conjuctiva which is the thin clear tissue of the eye and grows to cover the sclera or white eye area and grows directly into the cornea containing visible blood vessels. The cause of ocular rosacea pterygium varies with each patient with the most common causes being large exposure time periods to wind, sunlight and sand. Likewise other irritants can cause or increase the existing condition. Men are more likely to have ocular rosacea pterygium than women primarily as they have more exposure outside to weather conditions. Many women find that their eye makeup can trigger or aggravate their ophthalmic symptoms. Replace the entire bottle every three to four months as there is a good chance of bacterial growth from the applicator after use on your eyelids to the eye makeup bottle. Often when you experience a flare or worsening of your ocular rosacea, simply replacing your eye makeup can easily solve the problem as bacteria can reproduce rapidly in mascara, eye liner or eye shadow containers. Each time you use an eye makeup product it is exposed to airborne bacteria and pollutants as well as bacteria that is always present on the skin’s surface. Anti-wrinkle creams on the face and around the eye area is a source of an ocular flare. We all desire to minimize the tiny wrinkles around the eyes but unfortunately the anti-aging ingredients in these creams are often too harsh and aggressive for the sensitive or delicate skin around the eye area. To topically minimize the wrinkles, apply a drop of jojoba oil at night and during the day. Also, increase the moisture around the eye area by increasing your alkaline water intake. Increasing your water intake will plump up or fill the dehydrated skin that forms the wrinkles from the deeper layers of the skin where the wrinkles actually begin to the surface to form.